Several experiences with robot-assisted laparoscopic pyeloplasty have demonstrated the feasibility of this technique in providing improved surgical dexterity and decreasing operative times (21-23,25-29,35-39). Gettman et al. compared the da Vinci Robotic System to the standard laparoscopic pyeloplasty (23). The investigators noted that the Anderson-Hynes pyeloplasty is feasible with either technique. Procedures performed with the da Vinci robot resulted in overall decreased operative times when compared to standard laparoscopy. Gettman et al. also reviewed nine patients who underwent laparoscopic Anderson-Hynes pyeloplasty using the da Vinci system (25). The total mean operative time was 138.8 minutes (range 80-215), of which the mean suturing time was 62.4 minutes (range 40-115). Estimated blood loss was less than 50 mL in all cases, and the length of hospitalization averaged 4.7 days (range 4-11). Although there were no intraoperative complications, one patient (11.1%) required postoperative open exploration to repair a persistent renal pelvis defect. At short-term follow-up of 4.1 months (range less than 1-8 months), all procedures were successful on the basis of the subjective and radiographic data. In this series, robot-assisted laparoscopic pyeloplasty resulted in favorable overall operative times, suturing times, and short-term success rates. Peschel et al. presented their clinical experience of 19 patients in whom Anderson-Hynes pyeloplasty and nondis-membered pyeloplasty were performed (28). The operative time and hospital stay in both groups were in the range of 90 to 180 and 75 to 130 minutes and 4.7 and 4.5 days, respectively. An overall objective success of 100% was achieved. Another group from France also published an 18 case series of robotic-assisted pyeloplasty with a mean operative time and suturing time of 147 minutes and 42 minutes. The average hospital stay was approximately 6.5 days (29). In our combined institutional series, all surgeons were able to reduce their operative times (skin to skin) from an average of 283.3 minutes for the first five cases to 192 minutes for the most recent five cases (p < 0.001). As even more experience is gained with this procedure, it is likely that this operating time can be reduced even further. In addition, most surgeons preferred to start the case with standard laparoscopic techniques. Reasons for this include that the mobilization of the colon, duodenum, liver, spleen, or pancreas is more easily performed with laparoscopic instruments. Also, during the time of laparoscopy, the surgical staff may set up the da Vinci robot. Being performed at a teaching institution, the laparoscopic portion allows all members of the surgical team to be involved with the surgery. Finally, the amount of time required to dock the da Vinci system is only 10 to 15 minutes. With more experience, all surgeons will likely start the procedure using only the robot (40). We exclusively performed the Anderson-Hynes pyeloplasty repair using the da Vinci robot. This repair is the gold standard for open pyeloplasty repairs and the robot allowed us to duplicate this procedure in the most complicated cases. Intrinsic problems were easily excised and repaired. Exposure and repair of extrinsic problems such as crossing vessels were readily addressed. Patients with concomitant stones were successfully addressed at the time of surgery. 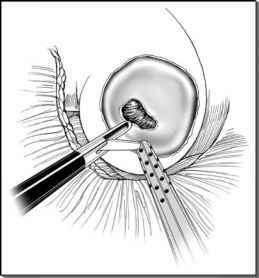 The larger stones were grasped and extracted under direct vision using a flexible cystoscope. The smaller stones were easily washed out with suction and irrigation. Other authors have similar experiences. Laparoscopic surgeons continue to show a preference for transperitoneal laparo-scopy; however, the feasibility of retroperitoneoscopic pyeloplasty has assisted in elucidating advantages and disadvantages of both approaches. During pyeloplasty, the transperitoneal approach offers ease in identifying, dissecting, and mobilizing intra-abdominal structures, whereas the potential disadvantages include prolonged ileus, adhesion formation, and injury to adjacent viscera. The major advantage of the retroperitoneoscopic approach is that it provides a direct route to the ureteropelvic junction and allows access without interference from intra-abdominal structures. However, the working space is more restricted and the absence of anatomic landmarks may make dissection more cumbersome for the inexperienced surgeon. Olsen et al. describe their experience using the robot surgical system in 13 children to perform robotic-assisted retroperitoneoscopic pyeloplasties (36). They concluded that the technically difficult procedure was easily performed; however, the surgeons without laparoscopic training will encounter problems because the same rules as in laparoscopy apply. These include correct port placement, maintenance of appropriate carbon dioxide pressure, and the basic principle of laparoscopic dissection. In addition, orientation in the retroperitoneal space can be difficult because the surgeon in a remote placement from the patient has no sense of up and down.